This facility has two separated pipe lines, water for drinking and miscellaneous use. Thus, we recycle the drain water from RO membrane for water for miscellaneous use to cut more cost. We are planning to use this drain water from RO membrane for the heat exchangers in air conditioning units because of its fixed temperature. The utilization of groundwater is proposed for the resource of the saving-energy effect. We propose a system that offers peace of mind and secures treated ground water supply during the time of disaster. This system is also popular among the Kitchen staffs because they can use the high quality water for cooking. In addition, a suitable environment was created by the use of treated well water for the fireflies in the nearby creeks (because freshwater snails that are the food for the fireflies are increasing). Our maintenance staffs also are encouraged by the joyful voices from the facility users and staffs. We had difficulty utilizing the original groundwater from this facility because it has more arsenic than Japanese drinking water standard (Less than 0.01mg/l). Yet we overcome this problem by using our special filter removes arsenic with particulate iron hydroxides. It absorbs and removes arsenic safely. Parking space is crucial for attracting customers. At the designing stage, we were planning to use a regular parking space; however, we utilized the dead space under the parking slope instead by implementing our space saving design. As the result, our customer could use the space for more parking lots. 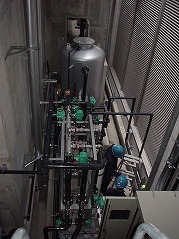 The ground water to use at the resort hotel in the biggest island of SETOUCHI is includes seawater. In any situation, we maintain stable water supply with our technology. We provide our service which our customer can be satisfied with using plenty of good quality water which is utilized water resources and the cost is saved. Our system can be switched the source of water either underground water or clean water. We have prepared against disaster when we cannot using water, we have installed a faucet to use for emergency. It is not only to use ground water in the hospital, but also available to support for the people who are living in the disaster area. We have maintained lifelines for our customer who can be provide their healthcare anytime and their corporate philanthropy, become the must-have item.